"My work always begins with an emotion. Landscape or other representational art originates with my personal reflection of the subject matter. For example, the image of a particular tree in Spring may stick with me for years until I finally make it “mine”, or perhaps the morning light on the leaves of a geranium warrants my attention. With non-representational work, I find the source of my inspiration is often a direct response to an event (a Presidential election) or the human condition (joy, fear, understanding, acceptance of a truth). Without exception, the selection of my materials is an integral part of the development of any work I produce. ‘Swish’ began with a horizontal line. That line, positioned in the middle of the panel, represented feelings of distrust I felt at that moment. Then I searched for the material, which would bring the line alive. 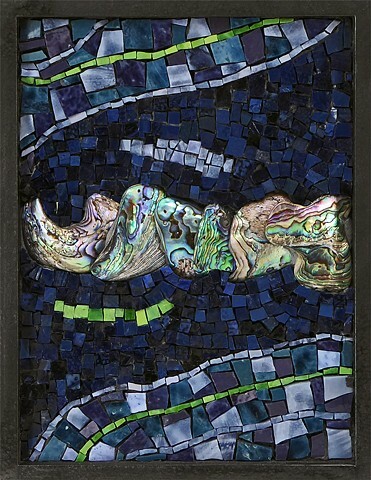 The varying shapes and sizes of Paua shells and the way in which abalone reflects light was just right. I felt the line begin to dance as I positioned the shells on the panel. From there, I worked with color, line, and the size of the tesserae to enhance the movement of the central element.